I am not sure that my readers are noticed it (my sugar tooth) or nt. I am sooo fond of sugar that I don’t or can’t want to live without it. That’s why I have huge collection of sweet recipes. This one is sweet recipe from me. Hope it will remind you guys your childhood. 1. Mix yeast, sugar and water together and let it sits for 5 minutes or till you can see air bubble in the mixture. 2. Break the egg and keep 1 tablespoon egg white aside. 3. Mix all ingredients together and knead well till the dough becomes smooth and elastic. 4. Place the dough in a bowl and cover it. 5. Leave the bowl in a warm place to rise till it becomes double (approx 1hr). 6. Knock down the dough then knead it for 2 minutes and divide the dough into 6 balls. 7. Roll each ball and make 1.8 feet long. 8. With the half of it twist together and with other half roll beside it. 9. Place each bun on a greased baking tray and brush top of the bun with water. 10. Leave the tray in warm to double in size. 11. Brush the bun with egg white and bake in preheated oven at 200˚C for 20-25 minutes. 12. Take out from oven and let it cool down. 13. Whip the butter, sugar and milk till it becomes soft butter cream. 14. 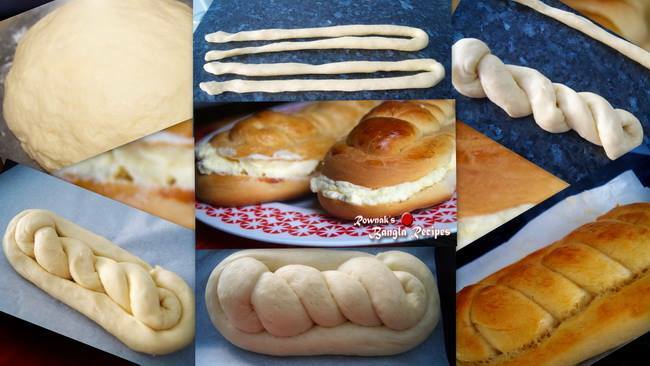 Cut the bun and spread the butter cream. 15. 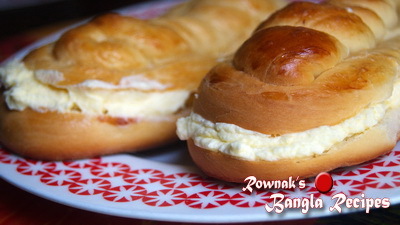 Enjoy the Butter bun with sweet childhood memories. Tips: Dough needs to be soft. If you need, you can add bit more warm milk.